This intriguing novel is a departure from Sharp’s acclaimed Charlie Fox thrillers, as this ‘standalone’ narrative has an opening that is as powerful as it is insightful and disturbing. Newly qualified Crime Scene Investigator Grace McColl and DC Nick Weston are called out to investigate a shooting. On the first time they meet, they consider that there is something more complicated about this case, something troubling. It seems that there is a killer stalking the Lake District; one who carries as Gun. Nick Weston’s past has brought him to Cumbria, transferred from London. He is not welcomed by his police colleagues. They are wary of him, as he is an outsider. Grace is also an outsider; committed to her job – she is an intelligent woman who has something to prove, as there is a shadow in her past, one that requires redemption. The working relationship and chemistry between Grace and Nick is finely drawn, with excellent characterisation and observation, making the reader ponder if this is the start of a new series. The secondary characters are equally well developed including Edith, a lonely, unloved - and in some ways an unlovable teenager; and then there is the deeply troubled Patrick. 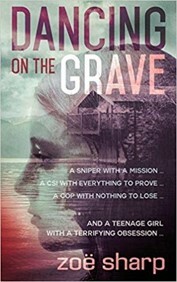 Zoë Sharp’s latest work is a hard book to review without spoiling the complex journey, for the sniper maybe connected to something far more troubling, politically, militarily, with linkages to some powerful and dangerous people. I highly recommend Dancing on the Grave, but a warning as there is dark violence, and the story will rest uncomfortably in the mind, as it questions much about society, and what it takes to keep us safe.